Topclean is a symbol of laundry, dry-cleaning and pressing excellence. Our professional laundry experts exercise utmost care in cleaning and processing of garments/linens. We have developed our laundry & dry-cleaning processes to suit best to the nature and conditions of each individual garment such as your shirt, trouser, coat, kameez, saree, etc and winter wears of ladies and gentlemen. .
We inspect each garment/linen for stains. Stain analysis is needed to determine origin and structure of stain and to apply an appropriate removal method of stain. Your garments will get a great new look after been hand pressed. Topclean is the place where people come with their garments/linens for better cleaning, fresh smelling and steam pressing. We execute safe and effective dry cleaning that prevents shrinking and color bleeding of garments & linens. Topclean practices Eco - Friendly laundry processes at the time of laundering your garments/linens. We process your garments/linens with professionalism and integrity to provide you a complete service that satisfies you. • Premium Express services from factory. • Home pick-up and delivery services in a designated area. • Suitable washing process recommendation for special fabric of Bangladeshi fashion houses. These services are fine-tuned to suit different customers’ requirements. We deal with a range of customers including guest houses, large hotels, clubs, airlines, restaurants and other Institutes. Customer Satisfaction is our highest priority. Considering your busy schedule we remain open 9 am to 8pm(Except shops inside market) to serve you except weekly and govt. holidays. You can pickup your smelling fresh clean laundry at your convenient. Find a shop location near you. Find out service status of your garments at our shops. 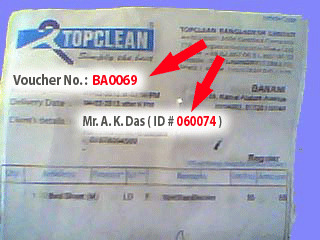 Ask Topclean if you have any questions or comments. 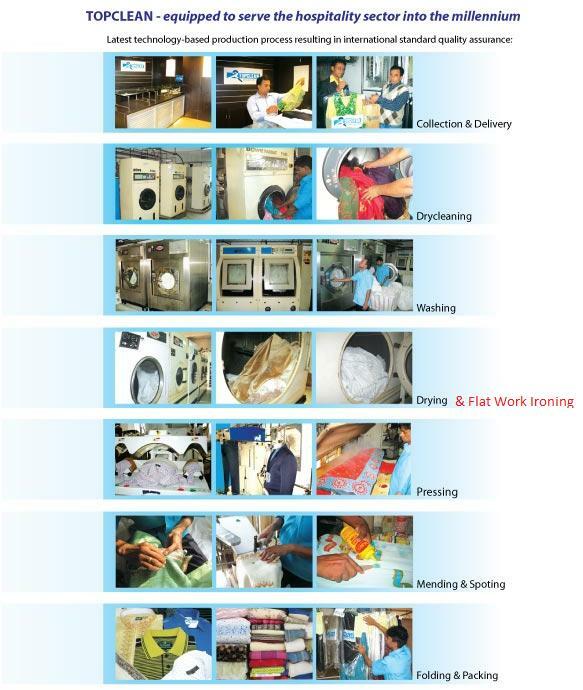 If you have not yet given your garments to Topclean for Laundry-Drycleaning, we invite you to visit our shop or factory, which one is convenient. If you are an existing customer, we appreciate your business with us and look forward to serving you in the future also. In broad sense “all the activities incurred in a laundry-dryclean industry to process (washing, pressing and packing) garments/linens” is called laundry. In a different way we can say “Laundry” – A commercial establishment for doing the wash of garments/linens. But when we differentiate the laundry with dryclean, we say “Laundry” is washing of garments/linens with/through water and various types of cleaning agents”. The washing cycle of the laundry can be as: pre-wash, wash, rinse and extract. The common problems of the laundry washing are shrinkage and color bleed. Dryclean is a cleaning process done in a machine with/through Solvent (Perchloroethylene) for safely cleaning and preserving color of the delicate fabric. The Dryclean machine is specially designed with respect to the chemical properties – Solvent (Perchloroethylene). The Solvent is being used to remove soil and stain from the fabric. The term “Dry-clean” is misleading. The cleaning is done with “Solvent” which is a liquid chemical but does not contain any water and does not penetrate the fabric like water. When cloths loaded in the machine, chemical and mechanical actions take place to loosen embedded dirt of the cloths. Throughout the dry-clean process, the solvent is filtered or distilled to keep soil from resettling on clothes. After washing-rinsing-extracting cycle, cloths are dried in the same machine and no residual solvent smell remains in the cloths. • Use of a specially designed machine. • Use of a solvent. • Relative humidity levels up to 75 percent. • Steam press or steam air finish is recommended for the dry-cleaned fabric. Topclean provides state of the art cleaning technology for all fabricare. Services include, professional stain removal (pre-spotting), cleaning and expert finishing of each garment. Regular Items: Regular fabrics are heavy in weight and strong, and include wools, cottons and some polyesters and rayons, and can be any color, except white. Whites Items: Our professionals take special care to ensure that white garments sparkle! Delicate Items: This category is for fine weave fabrics with silk-like qualities (such as fine silks, rayons, fine polyesters, sheer fabrics and chiffons). It also includes angora, cashmere and velvet garments that require special handling and extra time to clean. Gentle cleaning protects the natural fabrics while renewing colors and textures. Fancy Items: Garments with small amounts of less, zari, puti, stone and fancy buttons require special care to preserve their style. See Formal Wear for more information. Topclean is committed to make you look good. Buttons are tightened or replaced if needed. Collars and cuffs are perfectly pressed. Shirts starched as per your preference, then place it on hangers or fold, again according to your preference. Topclean understands that Formal Wear is the main attire of your clothing items. Garments are thoroughly inspected for spots, tears, or other problem areas that require special attention. A gentle cleaning is done. Fluff drying also done if needed, fluff-drying ensures that the garments suffer no ill effects from over-exposure to heat. All garments are pressed and hand finished. We take special care of your formal wear to make it shine - spotless, bright and beautiful. Some formal wear garments have good amount of shiny/glitter flecks, and these items require hand cleaning and special finishing. Topclean uses fine conditioners and cleaners to gently remove dirt and soil while leaving the leather soft and smooth. It is entirely a hand process item and needs extra time and care to clean and protect your leather goods. Topclean provides expert care for bed sheets, bedspreads, napkins, table cloths and other fine household fabrics. We gently remove even the strongest dirt, make white more bright and beautiful. After washing napkin and table cloths are specially pressed at Flatwork Ironer for extra crispy body and texture, it will help you to décor the dining table smartly. Our experts have developed laundry testing kit for fabric test before and after processing. In addition to that we up-to-date our selves with latest testing kits through our chemical supplier. 1. Please tell our shop attendant about a stain of your garment/linen. Even if the stain is obvious, tell everything you know about it, including the staining substance, any home removal attempts and how long ago the stain occurred. We go through several different procedures to remove stains, depending on the fabric and type of stain. Fruit juices, oily stains, soda, coffee, and other substances are difficult to remove and require special attention. Some stains are impossible to remove. We are able to remove about 90% of all stains. 2. Please don't allow a stain to set in. The sooner a stained garment is cleaned, the more likely the stain can be removed. Do not iron stained or soiled clothes--it will set the stain and drive the soil deeper into the fabric. If you do any wrong procedure to remove it, it can make impossible for us to remove the stain. Why risk ruining your favorite garment just to save some money? 3. Please tell us about any "invisible" stains. The stains from white wine, soft drinks and sugary substances, as these tend to become "invisible", these seem to disappear when they dry. It's important to point out ALL stains to us, we know how to treat invisible or lightly - stained areas prior to cleaning. 4. Never store clothes with a plastic/poly bag in your wardrobe/closet. The plastic/poly bag we use is only to protect your garments from dust in open area. If you leave your garment with plastic/poly bag in closet , it causes humidity to condense in the bag, weakening the fibers and sometimes discoloring your clothes. Please do not keep them in places where there is excessive heat or moisture. 5. To protect your cloth avoid contact with perspiration, perfume, beverage and hair products, especially on silk items. The alcohol in some of these products can affect some dyes, as well as cause stains. Body oils and perspiration can also create a permanent yellow discoloration and weaken the fabric. Don't delay in taking your clothes with these types of stains to us. 1. Topclean cannot be held responsible for any damage resulting from the laundry processing or loss of buttons, ornaments or anything left in the pockets. 2. Due to conditions and characteristics of articles, all goods sent for laundering and drycleaning are accepted by Topclean at Client’s Risk. 3. No liability can be accepted for defects or damage to articles during treatment which are susceptible to methods of manufacture or deterioration caused by wear and exposure. 4. In case of any loss or damage proved to be our negligence, our liability shall be limited to a particular amount not exceeding 10 times the charge of service rendered. 5. All claims must be submitted within 24 hours from the receiving date of finished articles and must be accompanied by Article copy of Topclean voucher and article(s)’ number tag. 6. Prices are subject to change at the discretion of the Management. 7. Topclean will make every effort to provide service in time as specified above. However in case of any abnormal situation like strike, siege, disruption in electrical / gas / water supplies, traffic jam and complexity of fabrics, there could be some delay. 8. Topclean will not be held responsible for any Damage / Loss arising from non-collection of article(s) by the client within 30 days from delivery date. Regular Service – In time & on time delivery schedule at regular base. Express Service – Faster then Regular Service with 50% additional charge. Regular Express Service – Services by 24 hours at no extra cost.